Home advantage counts. But only if you are well-equipped to use it. With four spin options to call upon on a parched Eden Gardens pitch, Kolkata Knight Riders strangled Sunrisers Hyderabad to defend 171 and pull off a 22-run victory. The win helped them secure a playoff berth, while ending Mumbai Indians' journey in the tournament. 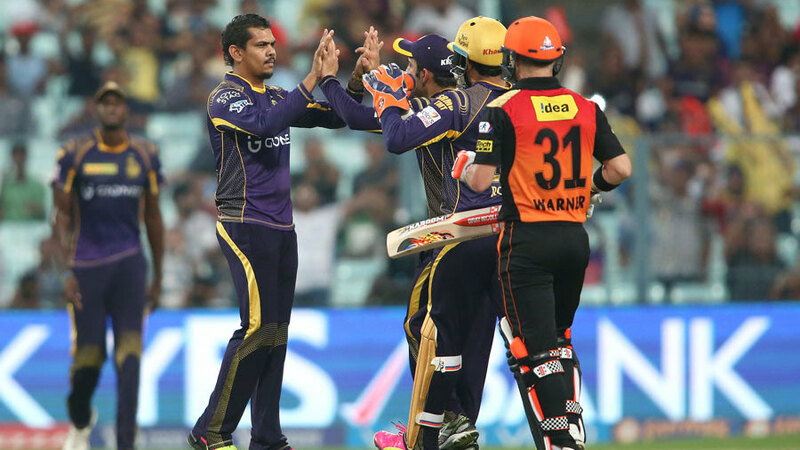 Sunil Narine delivered his most incisive bowling spell of the tournament, with figures of 3 for 26 in four overs. His partner in crime was Kuldeep Yadav, the 21-year-old chinaman bowler who had replaced Piyush Chawla in the Knight Riders XI. Kuldeep showed a willingness to flight the ball and repeatedly beat the batsmen with his sharp turn and canny googlies. Figures of 2 for 28, impressive as they are, do not do justice to the skill with which he bowled or the impact he made. As Sunrisers fell further and further behind, the match moved towards a tame finish.